-It fits on all Catrikes seat top bar. 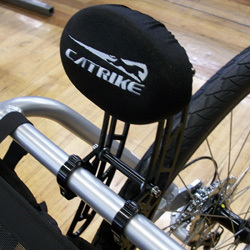 "This is definitely a must have for long distance riders and commuters. Couldnt do without it." "Support for your neck makes such a difference in riding long distances." "I believe one of the main reasons we buy a trike is for comfort. A comfortable head and neck rest only enhances the ride." "It would be easier to take a nap while cycling. Autopilot next would be good. I have joint replacements so would be great to be able to rest my neck and shoulder. Coolax mode."